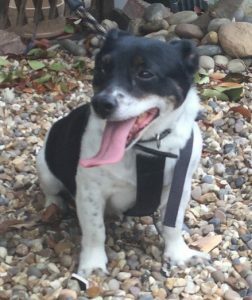 Animal Action Trust bring you happy chappy Jake who came into their care when his owner became too unwell to give him enough exercise. At only 9 years old he still needs at least an hour of gallivanting a day… even with those little legs! He’s now in a foster home in Essex where he’s been a thorough gentleman, apart from chasing the neighbour’s cat! Jake is a super companion and would be best suited to an active retired person or couple. 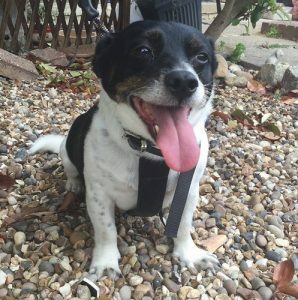 He’s generally a man’s man and needs a calm, definite sort of owner, with experience of Jack Russells. Maybe someone who likes to be busy pottering during the day and would like a small friend to following them about and help! Jake is a loving boy and likes a cuddle. He doesn’t do children though. He’s mature enough to know his own mind about many things and children is one of them. He must find them quite alarming as he will growl or even snap, out of fear if he feels too threatened by them. So he must be able to avoid children to keep his equanimity. He is clean and well behaved in the house. The only things he chews are soft toys if they look at him funny, or if he needs to let off some steam. Jake is a delightful little character. He’ll keep you entertained, be there for moral support in all you do and then snuggle up to you in the evening. Or, to download their adoption application form, click here. Please say you saw Jake on the Oldies Club website.